Postcard from Ruggero Bacci, written in Italian, to his son Aldo Bacci, October 24, 1942. 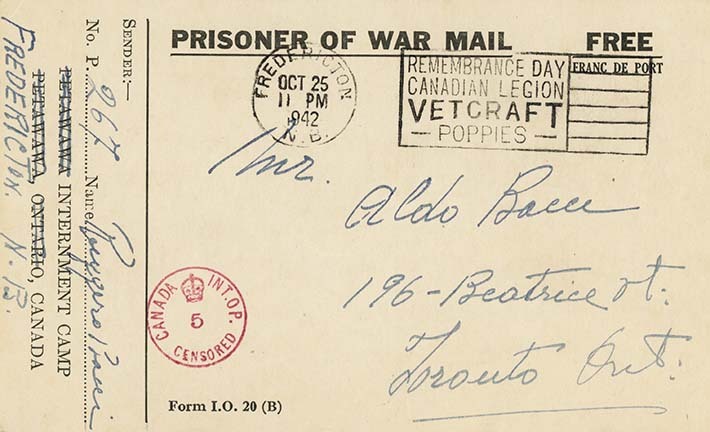 Internee Bacci writes to his eldest son, Aldo, that he is pleased to hear that he is well and that his mother's health is improving. He hopes Aldo received his postcard wishing him a happy birthday. He also wishes him a happy "name day" -- onomastico, and hopes it is the last one Aldo spends without his father. In Italy, traditionally, children's names are often associated with a saint or martyr. Children would receive small gifts on their Saint's Feast Day -- celebrated as their name day.